Khalil Ramos also reveals who he wants to be paired with in his next acting project. With the scenes in Princess and I getting more and more exciting every week, Khalil Ramos admitted he is happy to be part of such a successful Primetime Bida series. “It’s so fun. It’s really, really overwhelming and very unexpected kasi ayun nga, we all thought it was going to end na very soon but then we got news that it was extended for another month. We’re really happy and you know it’s all for the fans,” he told Push.com.ph. Khalil said he was lucky to learn a lot from one of the show’s directors, Rory Quintos. “At first, we were really, really scared—as in lahat kami—sa first ever taping namin with direk Rory. We were really pressured. I was pressured so I came thirty minutes before my call time. I came early to give a good impression. Sabi nga nila once you give a good impression tuloy-tuloy na yun and huwag ka lang magkakamali. So ayun, I did my best, siyempre nagpakitang gilas ako on the camera and she told me before I left nung araw na yun na she likes me daw, na I’m a very natural actor. I thanked her so much kasi I felt so accomplished. Direk Rory is very mabait. Maraming natatakot sa kanya pero once you get to know her mabait siya and you just have to do your job. Ganun kami so it’s a really great experience kasi kailangan maka-experience rin ng ganun, hindi lang yung pe-petiks-petiks lang,” he explained. Khalil admitted that Princess and I strengthened his resolve to pursue acting even further. “Before I really got into this, I really thought about it, kung gusto ko ba talaga ito, kung kaya ko ba. Eventually I took it kasi hindi naman lahat ng tao nabibigyan ng opportunity na ganito. Of course I tried it and until now I think my decision was one of the best decisions I’ve ever made because we’re number one. It’s really unexpected and overwhelming kasi kahit kami we didn’t expect na the show would be number one and would rate so high. So for a first teleserye, this experience has been really wow for me,” he said. The 16-year-old actor said he hopes he will get the chance to do more projects after PAI. “I want to act if I’m given more projects, movies or shows, I’ll definitely accept kasi I tried kung kaya ko ba talaga umarte, nakita ko and narinig ko from the directors na ayun nga, sinasabi nila na I can act. Direk Rory, direk Dado (Lomibao), direk Francis (Pasion) sabi nila malayo pa mararating ko sa acting so why not pursue it, di ba?” he said. The teen star also revealed what is the most challenging part for him as an actor. “Yung switching your emotions at will. Kasi for me, as a singer I need to act din. Wala namang mahirap sa pag-iiyak or ganyan kasi magagaling yung nagturo sa akin. Yun yung nahirapan ako kasi every scene, kahit sa isang scene mismo nag-si-switch eh. Let’s say in one scene iiyak ka tapos sa next scene hindi na. Minsan sandwiched pa. Switching emotions is hard kasi once you cry it really drains you. For me it drains me. Pero now it’s easier na kasi magagaling naman yung motivators, yung mga nagturo sa akin, sila direk Rahyan (carlos), direk Dado and I did workshops,” he shared . When asked who he would like to work with next as a possible leading lady, Khalil reluctantly admitted which celeb he admires. “Just to break the ice, kahit sino naman puwede pero I want to work with, kasi I heard babalik na si Julia Barretto so ayun,” he said. Khalil clarified this does not necessarily mean he admires the young actress. “Well wala pa naman (laughs). I got to know her during the Star Magic Ball. We hung out there. Mabait naman siya. If you ask me sino pa gusto ko makasama sa next project, it would definitely be her,” he admitted. The young singer-actor also shared what Princess and I fans can expect from best friend Kiko in the last few weeks of the series. “Well best friend Kiko won’t give up. Abangan nila yun kasi siyempre we’re extended na. I think. Kiko will still do everything to keep Mikay safe. Kasi madami ng mga danger na darating kay Mikay. He’ll be the best friend ‘til the end!” he said. 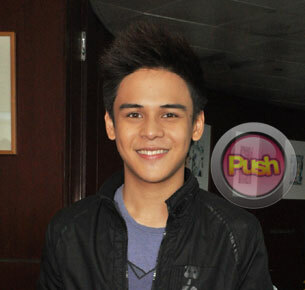 For more updates on Khalil Ramos, log on daily to Push.com.ph and follow @Push_Mina on Twitter.